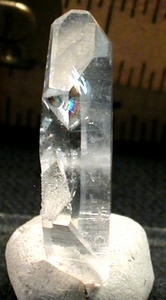 Chipper chippy doubly-terminated rare iris [permanent rainbow] Arkansas quartz crystal has a very rare EIGHT faces to each termination, as well as record keepers and a neat growth crater in its' belly with a veil line behind it. Seven and eight-edged channel faces. 3/8x 1-3/8" high, a nice portable miniature size.